There has been a sharp drop in the number of people at the shops as a result of the heavy snow, figures show. 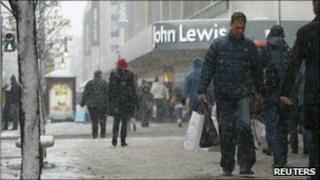 Retail researchers Synovate found footfall across the UK on Saturday was down 24.3% compared with 2009. The worst affected areas were the West Midlands and South East, down 30% year-on-year, with Scotland, badly hit the previous Saturday, down 4%. The survey is based on a sample of 6,000 retail outlets, excluding supermarkets. Synovate said that it expected numbers to increase on Sunday and beyond if there was no new major snowfall. The worst affected regions were: West Midlands, down 33.1%; South East England, down 32%; London, down 28.6%. The least affected regions were: East Midlands, down 3.1%; North East England, down 3.2%; Scotland, down 4.2%. Comparing Saturday 18 December with the previous Saturday, Synovate said shoppers were down 20.5% overall. Retailers reported a mixed picture on so-called super-Saturday, the name given to the last Saturday before Christmas. The Brent Cross shopping centre in north London closed its doors early on safety grounds as wintry showers hit the capital. But in Manchester's Trafford Centre, more than 20 tons of grit was used across the 150-acre site over 24 hours to make the roads and car parks accessible. Retailers were reporting "buoyant" trade, director of operations Gordon McKinnon said. On Sunday, John Lewis said sales at its 32 department stores across the UK were up 7% on a year ago at £120.3m for the seven days to Saturday, although they dipped slightly from the previous week's record. The group's Waitrose supermarkets were also hit by the weather, with Saturday's sales down 11% on last year, although turnover for the week at £131m was up on 2009. Meanwhile, thousands of extra postal deliveries were made on Sunday, and Royal Mail is starting evening deliveries to help clear the backlog caused by the bad weather. Royal Mail said that it expects to make up to 14,000 extra delivery rounds, weather permitting, over the next four evenings. Around two million homes should receive an evening delivery this week, the organisation said.